Why am I losing so many of customers? Why my conversions are not high? And you struggle to find what’s actually wrong. You are getting traffic. Both organic and paid. You are using social media to drive traffic. Your product portfolio is great. But still, your sales are not what it should be. Your website UX (user experience) may be the culprit here. You might think your website is a lot better (and it is) than your competitors. But is it giving your customers the best experience? Yeah, it hurts. But we often bring it in ourselves by not giving enough importance to the user experience. UX is everything. It always has been, but it’s undervalued and underinvested in. What is UX and why it matters? If you do build a great experience, customers tell each other about that. Word-of-mouth is very powerful. User experience is what your visitor feel- as she lands on your website. Browses through its various pages and checks your products. Is she enjoying being on your website? Is your website helping her meet her goals? Is she able to buy your product with ease and fast? And is she returning happy or unsatisfied? When we talk of UX, I know design comes into your mind. But good user experience is more than good design. Google, Airbnb etc., are not the finest of a designer’s imagination. But they offer great user experience. Utility: It helps users to choose and buy things and services they need. Usability: It makes the customer journey clear and easy. By reducing unnecessary clicks, time lost on page loading or inconvenient menu, etc. Accessibility: Your website should be accessible to all people. Desirability: Your website must offer enjoyable experience and makes users come back again. eCommerce UX is a serious problem. One that affects your visitors and your business. Because if you’re not improving your eCommerce UX, know that your competitors are doing it to gain a competitive edge. So you need to fix it ASAP. So, let’s talk about what those big UX mistakes are, and how you can fix them. Page loading time is an important part of your website’s UX. People on internet care a lot about speed. More so if they are using a mobile. The page speed is also a big factor in search engine rankings. So, give it a top priority and fix it at the earliest. How to increase your site speed? Check your website speed using Google PageSpeed Insights or other tools available. Do it for both desktop and mobile versions. The tools also recommend you on how to improve your website speed. Take the help of your website developer to fix them. Mobile friendliness is good for social media. How to make your eCommerce website mobile friendly? 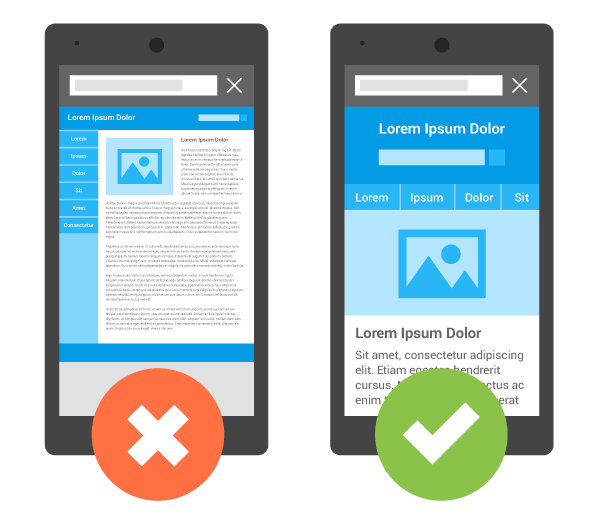 The first step is to check the mobile-friendliness of your site. Google has built a site where you can check the mobile-friendliness of your site. Check here. Make your website responsive: All website platforms come with mobile responsiveness. Here the desktop version renders on mobile devices in a friendly way. You can optimize the responsiveness by hiding some elements to boost customer experience. You can add new functionalities like direct call and mail to support in the mobile version. Think AMP or Accelerated Mobile Pages – To make the mobile web faster, Google introduced Accelerated Mobile Pages Project. Read this post from Google outlining guidelines on ‘GETTING STARTED WITH AMP FOR E-COMMERCE’ . Most of the website platforms now have AMP plugins. All you need to do is to install it on your website and you’re set. Guess which page gets the most traffic on your website? It’s the homepage. Your home page is where you create the first impression. Use your home page to build trust with the visitor. Convert him into a customer and create long-term relationships. The problem with home pages of eCommerce websites is that there is so much to show. There is a temptation to put in every important category, product, offers, and whatnot. Result: a page which is too busy, overwhelming and one that drives customer crazy and off your website. So how to design a homepage for happy experience? Keep it simple- You don’t have to put in everything. Think about your audience and showcase what matters to them. Convey your value proposition- why should a visitor buy from you and not your competitor. What’s unique about your site/business. Build trust- How secure is transacting on your website? Is customer privacy sage. Does your website have necessary certification and security tools? Make navigation easier- Put the ‘search box’ where it catches your customer’s eye. Design the menu to accommodate all your popular categories. Provide support- Put your customer support number at the top. Integrate live chat support to help your visitors. Like physical shoppers, online shoppers can’t touch and feel your product. And that’s why your product pages are important. They are a moment of truth. The difference between a visitor and a customer. Now how to create a persuasive product page? Write descriptive but honest product descriptions. Don’t rely on the stock description provided by manufacturers. Create your own taking your user’s motivation into mind. Be specific. Use layman terms to write your copy. And translate features into logical benefits. Use good images and a lot of them. Take pictures of your products from all angles, showcase all important features. Allow your users to zoom the image to know your product in detail. Make informative videos of your products. Videos are great as- they show, not only tell. You can provide a lot of information in a 1-minute video. Build user confidence with product reviews and customer testimonials. Remove her fears with the return policy, shipping costs, and customer support promise. Include customer testimonials. Make customer testimonials a part of your copy. Not some adornments at the end of the page. Write persuasive call to action. Motivate him to add your product to his cart. Recommend other related products to up-sell/cross-sell. Your customers want to be feel valued. One way to give that importance is through personalization. Picture this. You have a skilled shopping assistant to every person who walked into your store. Someone who knows your customer by the first name, remembers what she has bought in the past. And is able to timely intervene with deals and discounts to motivate her decisions. In a physical store, one understands customers through observations and conversations. The insights gained from those conversations help you identify customer needs. And offers you an opportunity to nurture personal relationships. Online medium offers no such luxury. You don’t even get to see your customers. But eCommerce websites have a massive edge over their brick and mortar counterparts. Thanks to data-driven personalization technologies. It’s possible for you to know your visitors in detail. And personalize interactions to make each visitor feel special and valued. Then target them with the relevant and timely message. How to personalize customer interactions and deliver a better experience and more conversions? There are many good personalization platforms available on the market. These platforms help you collect data to know more about your visitors. It helps you understand their preferences. And to create a tailor-made experience for your visitors. Onsite personalization- Greet your customer with her ‘first name’. Tell her that ‘she is important to you’, every time she visits your store. Customize user interaction based on where they come from. You can get data on Geolocation, channel source, the device they are using, etc. Personalization opportunities are endless for visitors who have created an account with you. You can use their buying history to recommend products, cross-sell, up-sell. Also, reward them for loyalty. Retargeting – Also called remarketing, it converts your window-shoppers into buyers. Say 3% of your visitors convert on their first visit to your store. Retargeting targets the 97% of personalized ads as they visit other websites online. Personalization can help you identify and create micro conversion milestones. It helps nurture relationships with your visitors, and later turn them into buyers. Email personalization- How would you feel if you get an email addressing you by your first name? Now compare this to a generic promotional email. I bet you won’t even open the latter. Personalized emails improve click-through rates by 14%, and conversion rates by 10%. Personalized emails work the same way. It collects data on your visitors buying history. Which products did they buy? What is the average order size? This data can help you send an email with product information and other content that is relevant to him. You can also segment or categorize all your visitors into groups. And then create a personalized email strategy for each group. Latest tools allow you to personalize to an extent of 1-to-1. This means you can send separate automated emails to each of your visitors. A lengthy and complex checkout process is a costly mistake. A lengthy checkout is same as a long queue on a physical store. Do you wish to give that experience? You need to make it easy for your customers to select your products, pay for it and complete their order. The more steps you put in your checkout process, the higher is the chance of your customers dropping out. How to create a simpler, faster checkout process? Think of a clear, logical and short buying process. Make a list of like information you would need from your visitor. And then collect this information in a logical form. Allow your visitors to add products to their cart and buy from the product page. Keep your process much shorter for existing customers with accounts. Most of their information needs to be auto-filled. Allow them to make changes to it if desired. Design a shorter, focussed checkout page free from any distractions. Give information on selected products like type, size, colors, quantity, and availability. Enable making changes on their order in the checkout page, without asking them to return to cart page. Don’t ask for the same information twice or repeat steps. Offer them many payment options including credit cards, e-wallets, PayPal, bank payment etc. When creating your website, it’s easy to get distracted by persuasive marketing techniques. By tricks that promise conversions. The temptation to collect emails. By fancy designs. But does the website still offers the best experience? Experience is the basis of success. And sales. More repeated visitors. More Sales. Think about your user- Have a deep look at your analytics. Understand your users. Do user research. What are their concerns? What are their goals? How can you earn their trust? What will make them happy? Think about your website- Why should someone buy from you? What makes you unique? Is your website as simple as it should be? Is it easy to find your products? Is it easy to reach any corner of the website from any other corner? Embrace technology- What’s the latest in tech stack? Will it help your users achieve their goals? Will it help you build customer loyalty? If yes then embrace it. Once you have answers to above questions. And start fixing the mistakes using the tips discussed above, your website’s UX will improve. That’s where the rubber will meet the road of your store’s success. What’s your UX strategy? How are you offering a happy experience to your users? Do you have any questions? Let’s discuss and learn in the comments section. If you liked the article, please share it with your friends.